Funcity’s 23,000 square foot air-conditions indoor facility offers roller skating, tactical laser tag, two large drop down TV screen’s for presentations, creative lighting, and a state of the art sound system for the ultimate in entertaining. Whether you’re a small or large business, or a non-profit organization (scouts, churches, fundraising group, etc.) we would like to help create an out of this world experience. Activities, such as team building, fellowship, skating badge programs, work parties for employees and their families, and many other events can be accommodated. 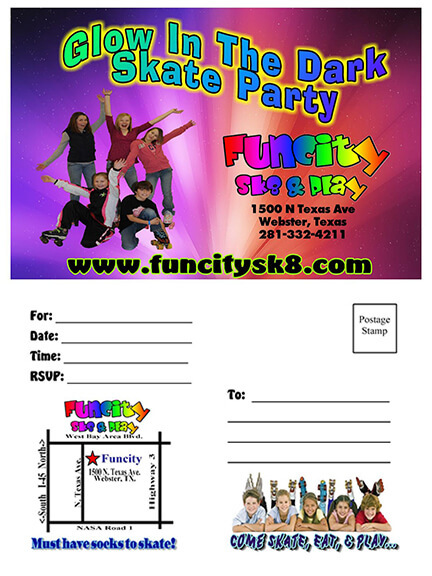 Roller skating and tactical laser tag are fun activities for children and adults of any age. Roller skating provides many health benefits and is recognized as one of the top activities to stay fit by the American Heart Association. Tactical laser tag helps to build confidence and better work relations through a number of innovative games, that require groups to work as a team to complete the tasks. Check out our cafe menu for a variety of delicious treats and don’t forget to ask about our discounted food options.